About a year and a half ago my middle daughter became ill. At first we thought it was the stomach flu and kept her home from school for the week. She went back to school the following week but within a few days she was sick again. Over the next two months she stayed home from school and went through every test imaginable, many blood tests, stool tests, ultra sounds, x-rays, etc. At first the doctors were going off the theory that she did have the stomach flu and must still have bacteria eating at her stomach lining. She was on antacids during all of the tests to keep the acid out of her stomach. On top of the severe stomach pain she now was getting headaches every day from the antacids. We finally had to submit to invasive testing, she went in for a scope and biopsy right before Christmas. The doctor called the next day to let us know that she had Eosinophilic Esophagitis (EE or EoE for short). What?? She went in for additional tests on Christmas Eve day and since then we’ve had to change everything she eats. EE is similar to Celiac disease in that it is an autoimmune allergy. Celiac disease is an allergy to gluten. EE is an allergy to protein, a little bit more difficult to avoid. At first we eliminated most foods from her diet except for rice and fruits and vegetables (except for peas, green beans and pineapple). We’ve slowly been able to add things in as we test them. One adjustment that has been more difficult is desserts. Making anything with gluten free flour, no eggs, no milk or butter is a challenge. 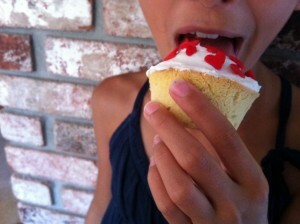 The cupcake recipe below can be adjusted to meet your child’s needs. Without eggs, butter and milk the resulting cupcakes tend to be dense and fall apart easily. The frosting is quite yummy and makes up for the drier cupcake. The flour we use is from Jules Gluten Free which is the best we’ve found. I use a recipe from Whole Foods and adjust for my daughter. Preheat oven to 350°F. Coat an 8-inch square or round cake pan or cupcake tin with olive or canola oil spray. Set aside. Cream butter with sugar in a large bowl until well blended. Add eggs and vanilla, beating with a wire whisk. Add flour and baking powder and continue to beat until well mixed. Pour batter into prepared pan. Bake for 40 to 45 minutes, or until done when tested with a toothpick. I baked my cupcakes for 25 minutes but each oven is different. Measure the shortening and the margarine into a medium sized mixing bowl. Cream this, using an electric hand mixer on the medium speed for about 30 seconds, using a rubber spatula to occasionally scrape down the sides of the bowl. Add the sifted confectionerís sugar, the vanilla extract, and the milk. Beat this, using the electric mixer on a medium speed, until for about 2-3 minutes, until light and fluffy, stopping every minute or so to scrape down the sides. Use immediately or refrigerate for up to a week. Allow to warm to room temperature for easy spreading. Let me know if you have any questions or advice, we’ve been doing this for a year and a half now and we are by no means pros. This entry was posted on 07/13/11 and is filed under random goodies.